AMD has used its CES 2017 platform to showcase Ryzen Ready products such as AMD Ryzen based high-performance desktop PCs and motherboards. In total the firm had on display 17 powerful and innovative AMD Ryzen based desktops from the likes of CyberPower PC, Medion, and PC Specialist. 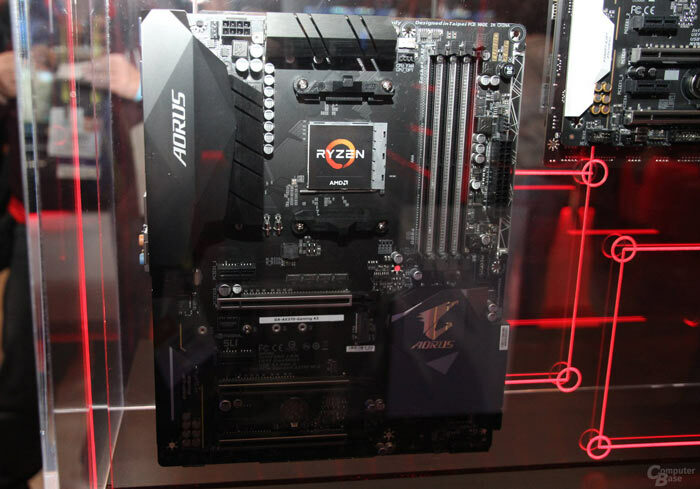 Furthermore 16 high-performance AM4 motherboards sporting the Ryzen X370 and X300 chipsets graced its CES 2017 exhibition area. There are also some new third party cooler designs that are Ryzen ready. Jim Anderson, SVP and GM of the Computing and Graphics Group at AMD, said that "2017 will be an unforgettable year for AMD, its technology partners and the PC industry as a whole, and we're thrilled to kick off the year at CES by showing wide arrays of high-performance motherboard and PC designs from our OEM partners for whom the future is Ryzen". Anderson went on to promise a good degree of choice and innovation from third parties in support of the new "impressive systems," that enthusiasts will seek to build. Partners including ASRock, Asus, Biostar, Gigabyte, and MSI are readying AM4 motherboards based around AMD's X370 and X300 chipsets. The X370 boards are aimed at those intending to build systems with the beefiest performance, newest features and expansive I/O options. Support for overclocking and dual graphics feature with these motherboards. Meanwhile those who want compact but powerful systems might be attracted to the X300 chipset which can be found on mini-ITX sized boards yet still manages to pack in Dual-channel DDR4 memory, NVMe, M.2 SATA devices, USB 3.1 Gen 1 and Gen 2, PCIe 3.0 capability. 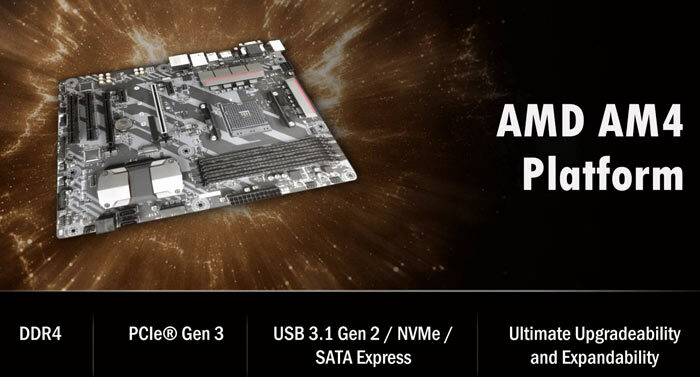 Whatever AM4 board you choose they feature dedicated PCIe lanes for USB, graphics, data and other I/O. Check out the Twitter video above for a good overview of the multitude of Ryzen PC systems on show. Last but not least 15 top cooler manufacturers and vendors are creating an array of aftermarket CPU coolers for AM4 processors. AMD name checks the likes of Noctua and EKWB as currently having such coolers ready or in development. AMD says that Ryzen processor-based PCs, AM4 motherboards, and compatible cooling solutions are expected to be available in Q1 2017. I see the marketroids have gotten to the naming system. Therefore, AMD better because higher number! Unfortunately they have too… I wonder how many people bought a 1060 GPU because its a higher number than a 480? Its sad but so many people buy based on numbers and brand but zero research. Is that cpu mounting bracket the same as AM3+? It looks it to me but I can't tell if the size/spacing is exactly the same. I am basically wondering if the likes of the corsair AIO coolers can simply be tightened onto that plastic mount as we could with AM3+? Looks similar. Only way to be sure is to get a Noctua HSF. They're terrific with after sales socket support.